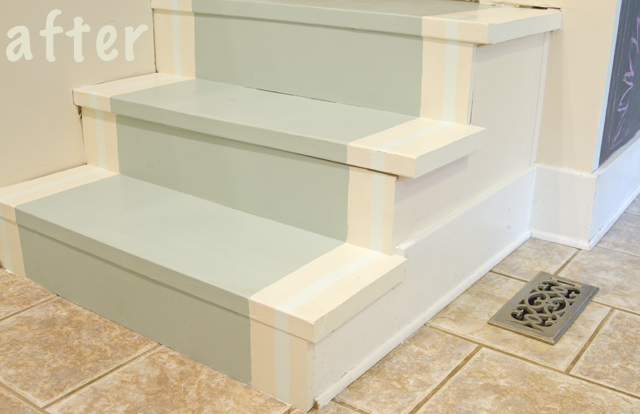 Black and White and Loved All Over: A Painted Stair Landing + Should I Rip Up All My Carpet and Paint My Wood Floors? 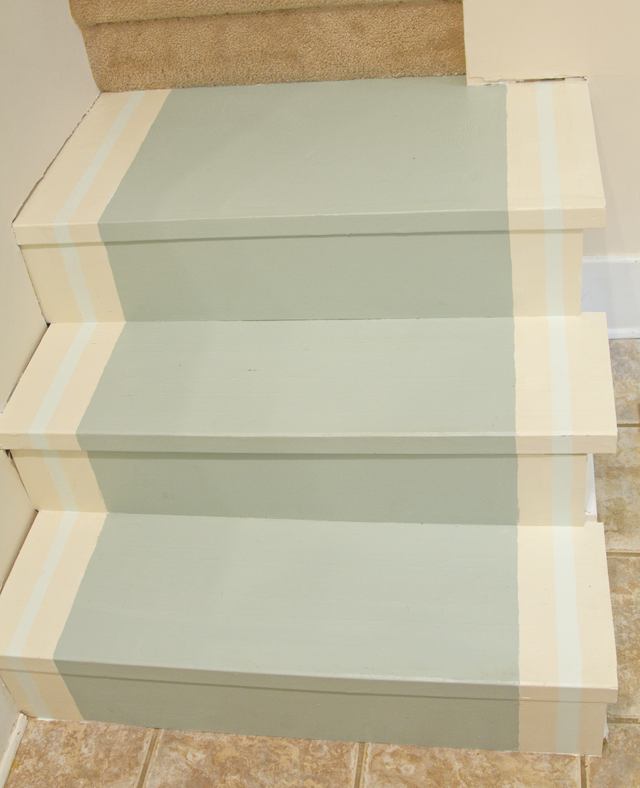 A Painted Stair Landing + Should I Rip Up All My Carpet and Paint My Wood Floors? A couple of weekends ago I decided to rip up the carpet on our bottom two stairs as well as on our stair landing. Our staircase comes down into our kitchen, which I've worked on a lot this past year (painting it mint, moving the refrigerator to a different wall, taking down one of the cabinets and installing open shelving, etc.) Our kitchen can be kind of cramped, especially if we have more than a few people over. Which means the stairs end up getting used as a seating area. The world's most hideous seating area, if you ask me. So my thought was that the subflooring under that carpet might be decent enough to just paint. My other thought was that if it wasn't I would just figure out how to fix it afterwards. Then I stopped thinking and ripped that shizz up. Turns out that what was under that carpet was about 150 staples and a whole bunch of gaps. 1) This photo shows the stairs immediately after I removed the carpet. This structure is what they refer to as "stringers," I've since learned. 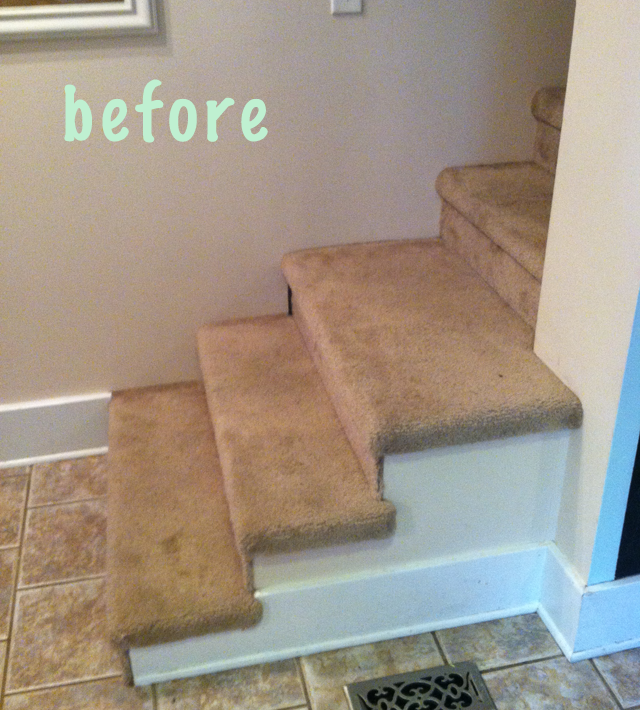 2) This photo shows the steps after I removed all the staples and carpet tack strips. 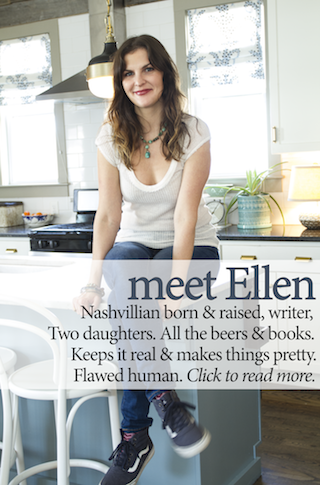 At this point, you might as well picture me sitting on my kitchen floor, completely dumbfounded by what to do next. 3) Luckily my friend Jeremy came over to help. He is super handy and builds houses for a living. He brought over some extra poplar stair risers he had on hand. He measured and cut the boards, installed the risers, and then showed me how to use a nail gun. (Seriously, so fun!) He could not have been kinder to rescue me from my DIY conundrum. After he left I sanded the plywood treads (one day I'd love to spring for some better quality wood but in the meantime...), patched any holes or divots I found, and then sanded the treads again. 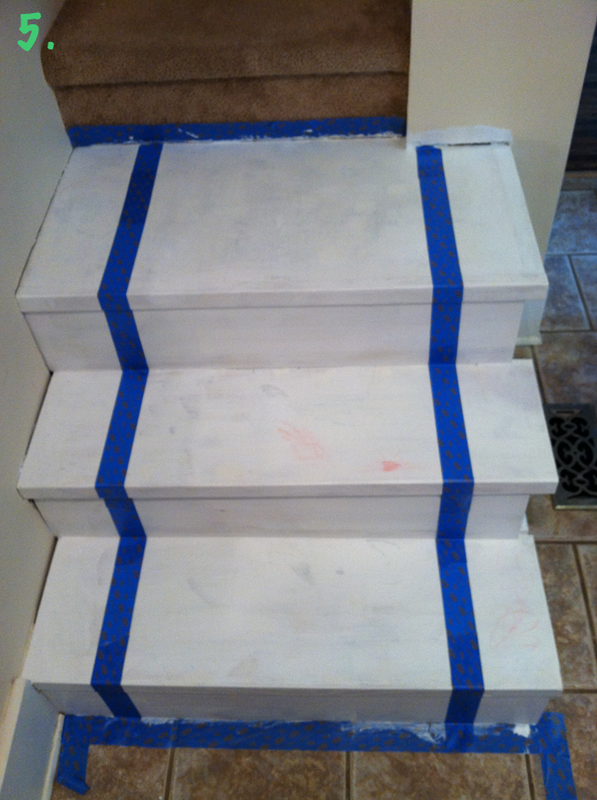 4) Then I primed all the steps with some shizz I had in the basement. 5) Then I made 'em cool. I used some off white porch paint I had to paint the sides and some of the Wyeth Blue paint I used to paint my front door to paint runners down the center. I also painted some mint stripes on the side. I mostly really like the way they turned out. Sure, I'd prefer to have gorgeous professionally done stairs, and I need to figure out how to add some trim around the sides where the stairs meet the walls, but I much prefer these guys to the carpet. Next up: The whole staircase. Seriously. Nekos is gonna have to help me this time though. When we bought this house six years ago I remember the renovater telling us that the hardwood floors upstairs weren't in good enough shape to refinish (like they were doing with the downstairs floors) and so they were just putting in carpet. Now, though, I'm wondering if they would be in good enough shape to just sand and paint; forget about refinishing. I have been loving white painted floors (although I am also obsessed with those pool blue floors that are lacquered to a high shine in the photo below). It seems like a big risk to take since we don't know what we'll find under all that carpet. But I figure I can just figure it out when the time comes? Have you ever painted wood floors or do you know anyone who has? Is it a good solution for floors in bad shape, and how did they hold up? 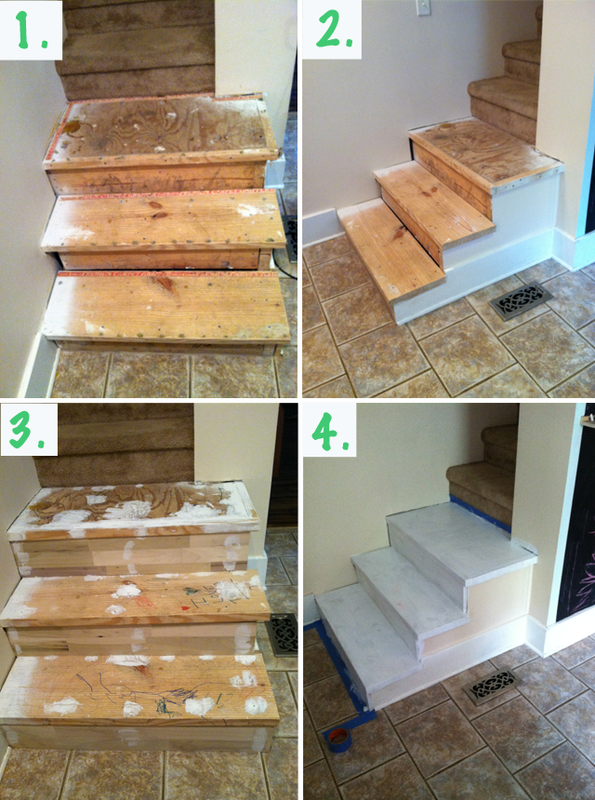 I absolutely love how your stairs came out! 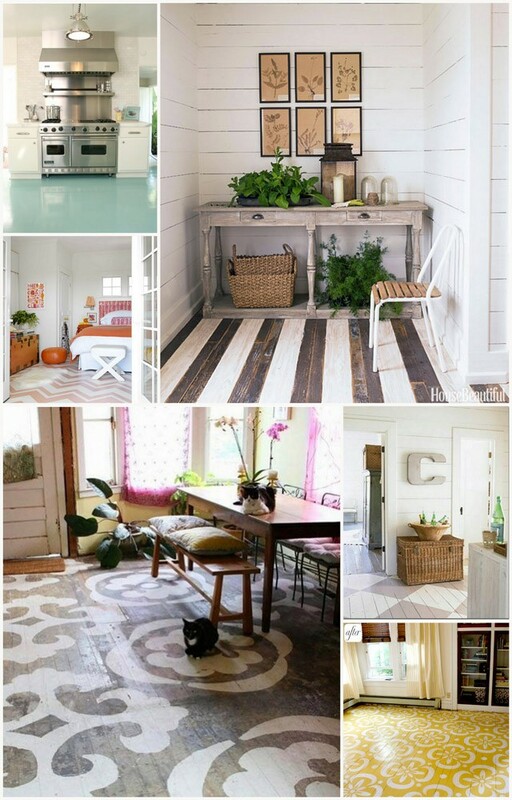 Wood floors are so much nicer than carpet, and I love the idea of painting them. So fun. I'm a fan of painted floors, although I've never done it myself. I think you should go for it because 1) Your stairs turned out amazing and 2) then I can read about it and figure out if I have it in me to do the same thing with my floors. Cute idea! Having read many of your posts, I know you're WAY more creative than I am, so what I'm about to tell you has probably already crossed your mind. 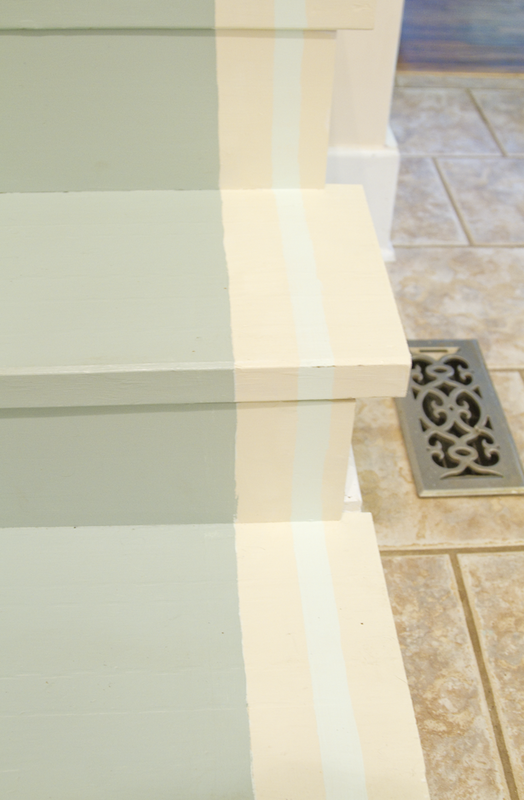 You may want to protect your paint job with 2-3 coats of polyurethane. A contractor told us that mixing "a little" sand in with the poly will keep it from being slick. Also, for trim, you might want to try something flat in place of the traditional quarter round. I'm thinking something about the size of a paint stirring stick. We yanked up the carpet in the nursery and painted the floors - the whole process is on my blog. It was a lot of work but totally worth it and I love the way it looks!